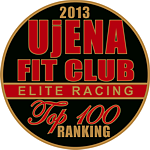 Members who post races on their Ujena Fit Club profiles are eligible to appear in the rankings. 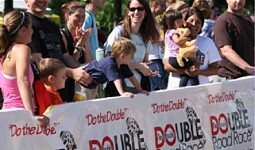 Members receive 100 points for each race they post and include their finish time. They also receive 20 points for each mile raced. Top 250 Men shown below. Only timed races with results posted on the internet count. If you do an event that includes other activities (like the Tri) only list the running distance and the time for that distance, however list your place for the overall event. The deadline to enter your 2013 races (for consideration in the contest) was noon (PST) January 31, 2014. The top 100 men and top 100 women will receive a special UjENA Fit Club Elite Racing Top 100 Ranking medal, as pictured to the right. Click here to add a 2013 race. You can still enter your races for 2013, but the contest period has concluded. The points listed on this page are frozen. Besides the medal, the top three men and women will receive FREE entry into two Double Road Races of their choice (not transferable). The overall winners, Chris Jones and Sharon Vos, will also be awarded up to a two night stay at our official hotel at the Pleasanton Double Road Race Dec 21, 2014. Click here for Women's Rankings. 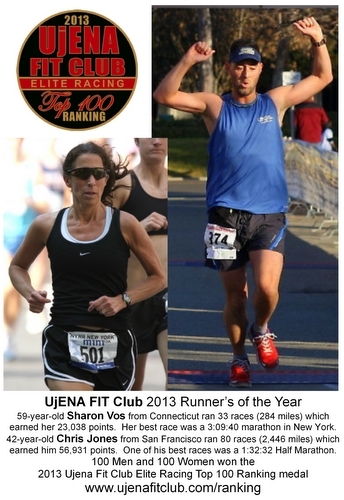 *Performance points are calculated on the Ujena Fit Club Men's and Women's Runner Performance page for 2013.